CURITIBA: Ecuador moved into second place in World Cup Group E as two goals from Enner Valencia handed them a 2-1 win over Honduras in Curitiba on Friday. Honduras had looked on course for their first ever World Cup win when Carlo Costly fired them in front on 31 minutes, but Valencia levelled from close range just three minutes later. And the Pachuca striker moved alongside Karim Benzema, Robin Van Persie, Thomas Mueller and Arjen Robben as the tournament's joint top scorer on three goals when he headed home the winner from Walter Ayovi's free-kick 25 minutes from time. "Scoring at a World Cup has been something I have dreamed of since I was a child and thanks to the coaching staff and my teammates that has come true," said Valencia. "The golden boot is not something I am thinking about. The most important thing is qualifying from the group and if that comes thanks to more goals from me then all the better." Ecuador now lead Switzerland on goal difference with both sides locked on three points after two games behind group leaders France on six. However, Honduras can also still qualify despite losing both their games so far should they heavily defeat the Swiss and Ecuador lose to France. 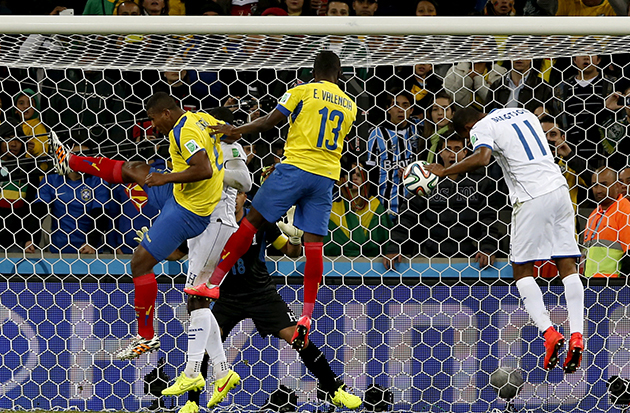 And Honduras boss Luis Suarez insisted they have to believe anything is possible against Switzerland. "It would be worse if we were eliminated and this game didn't mean anything. This chance still exists and we have to try," he said. "Now more than ever we have to fight for the country. If a victory means qualification then great, but if it doesn't at least we have given everything until the end." After a nervy opening from both sides the game began to open up midway through the half and Honduras felt they had a strong penalty appeal waved away by Australian referee Benjamin Williams when Costly went down under pressure from Juan Paredes. Moments later it was Ecuador who should have taken the lead as Valencia timed his run onto Frickson Erazo's long ball forward perfectly but couldn't find the target when left with just Noel Valladares to beat. Honduras's first clear chance of the game came just before the half hour mark when Victor Bernardez headed wide when unmarked at the far post. Four minutes later, though, Costly did net his country's first World Cup goal in five games stretching back to their inaugural appearance at the finals in 1982 as he beat Jorge Guagua to a high ball before slamming home left footed. The Hondurans' lead was short-lived as within three minutes Juan Paredes' deflected effort fell perfectly for Valencia to bundle home his second goal of the tournament. Honduras ended the half the stronger side as Bernardez's powerful free-kick was turned behind by Alexander Dominguez and Jerry Bengston rightly had a goal ruled out for handball after Costly's initial header had come back off the post. 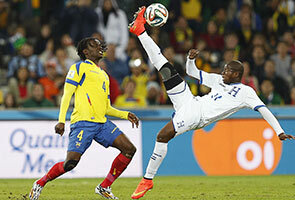 After the break it was Ecuador's turn to feel aggrieved with referee Williams as he again was unmoved when Felipe Caicedo tumbled under a challenge from Maynor Figueroa. However, that decision mattered little in the end as Valencia netted the winner when he rose highest to meet Ayovi's sweet delivery.